Theater for the very young gets a nod of approval from core demographic. 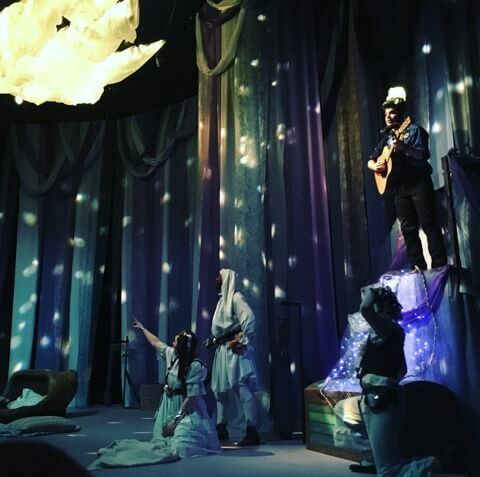 If you have kids ages 2-5 it can be difficult to find live theater that both keeps their interest and is worth the money if they start screaming mid-way through and you need to make a quick exit. It can be JUST as hard finding children’s theater that you as a parent also enjoy. The Rose Theaters’ ‘Wynken, Blynken and Nod’ takes care of all of that for you. From beginning to end the 40-minute show is completely immersive, interesting and awe-inspiring. I took my three-year old Shine Avett with me to an 11am show. He is pretty used to be dragged to new events and is always down for the ride, but I have noticed that some children’s theater and even movies, are too long to hold his attention, and he soon remembers that he’s sleepy, hungry, THIRSTY, and has toys at home. Forty minutes is PERFECT for this age group, and that of course is by design. 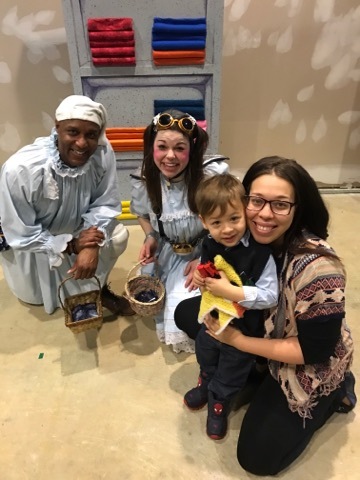 ‘Wynken’s director Ashley Laverty, holds her MFA in Theater for Youth, and knows well how to grab and keep the attention of littles. 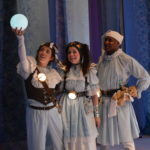 Wynken, Blynken and Nod are played by Omaha theater veteran Tyrone Beasley, and Rose regulars Jessica Burill-Logue and Chloe Langford, who are narrative-lullabied by the Raffi-voiced Jesse Wohlman. The audience is greeted with soft music and free to sit on the floor or in seats. Shine and I choose the floor. Wynken, Blynken and Nod make their way through the audience with no words, but rather sounds of childlike wonder, wearing costumes that were a sweet mix of homemade night wear and quiet steampunk. Blankets and old-fashioned night caps and a lot of imagination. As the classic story unfolds we are taken on a journey of sea and sky, as they set off in their old wooden shoe to find the herring fish. Along the way we encounter beautiful sea creatures, a singing moon, obstacles to overcome and great joy in doing so. I found myself many times, also looking up wide-eyed and open mouthed, struck by the magic happening in the room. Wynkens’ dynamic aesthetic is Laverty’s, it’s special in the way that it’s both so specific and yet simple. Ceiling high papers hang in blue and purple hues, waves of the sea crash in the chairs next to us. It’s a place where children are free to be themselves, encouraged to participate and wonder aloud about everything they’re taking in, the parents were the tagalongs this time. A welcome change. Laverty said she was looking for something, “gentle and beautiful,” and she fully succeeded. The dream-like essence of the show promotes a naturally quiet atmosphere (lavender-scented misting, anyone?) and the absence of heavy text allow the audience to follow along primarily visually. Oh, hold on, Shine wants to say something. Wynken, Blynken and Nod can be experienced at The Rose in the Hitchcock Theater.